Paramedics assess every patient they encounter, but is there more we could be doing? Should we be asking more, or different questions to get a more holistic sense of the patient's health? Krista Cockrell is a US-trained paramedic who teaches in the paramedicine and public health programs at Western Sydney University. Krista's research looks at a standardised tool for assessing patient health resilience based on the concept of salutogenesis. This short tool can be used by paramedics to look holistically at a patient and measure their resilience in health emergencies, which has implications for self-care, representation, and finding the right referrals for that patient. 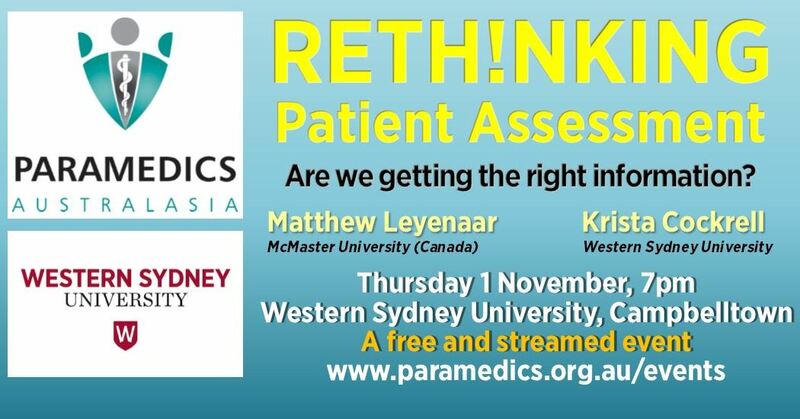 These two research projects open up a new dimension of paramedic assessment which not only assessed the chief complaint, but the whole person. By assessing patients holistically, paramedics can not only determine the right care plan for the patient but address a range of social and environmental factors which impact in both the short and long term on the patient's health. This fusion of emergency and public health addresses patients in a whole of health approach and impacts not only short term outcomes but the patient's long term engagement with their health. This event will be streamed. The streaming link will be published on Twitter and Facebook the day of the event. You only need to register if you are physically attending. Contact Buck Reed for more information.